In this series, Rosslyn Cares, we feature stories from our neighborhood that remind us of the importance of taking care of others and being thankful for what we have. In October, we asked our weekly eblast subscribers to nominate Rosslyn residents and workers who embody the spirit of Rosslyn Cares: people who are kind and helpful, and who always seem to go the extra mile. 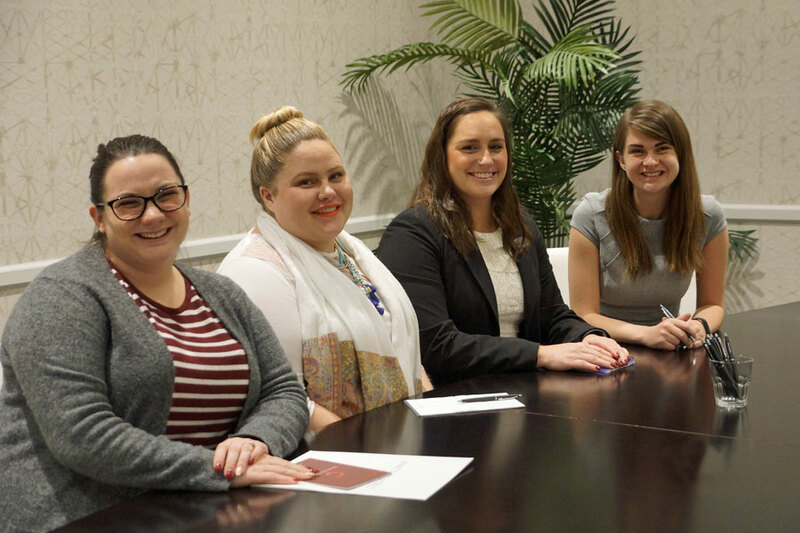 We received several nominations for different individuals, but only one person received three separate (and glowing) submissions from her colleagues: Hyatt Centric Arlington's Senior Event Sales Manager Nicole Sirutis. Here is her story. Spend time with Nicole Sirutis, Hyatt Centric Arlington's senior event sales manager, and the first thing you notice is how humble she is. She's polished and confident and tremendously positive, but she's not trying to impress. "When I heard you were going to write an article about me, I thought it was crazy," she says. "I just do my job. I don't do anything special." But her coworkers, clearly, would beg to differ. In the Rosslyn Cares nomination letters they wrote for her, they describe her as "selfless," "giving," and "warm, welcoming and always smiling." One colleague details how Nicole goes above and beyond to ensure hotel events run smoothly for her clients. Another mentions how she comes in on her days off to help other departments, even when there's nothing in it for her. Team members say she volunteers in the community and encourages others to get involved, too. And she's energetic and inclusive: She is always reaching out to welcome new staff and organize fun activities. "Nicole has the most generous, caring spirit," writes one. Nicole Sirutis, third from left, and her colleagues at Hyatt Centric, l to r: Annamarie Brown, JJ Abuelhawa and Carly Ingle. Nicole seems touched to learn how others see her. The nominations reflect positively on her, and on the colleagues who took the time to write them. So, of course, beyond wanting to know about her work and her professional experiences, we were curious about what makes her tick. How does one become the kind of person who three separate colleagues feel is deserving of special recognition? How does one become the kind of person who is always smiling and making others feel welcome and appreciated? Partly, Nicole's attitude goes back to her family. She grew up in Summit, New Jersey, as one of five children. Her family was large and loud, with multiple pets adding to the din. "We always had so much going on at home, and with such a large family, I learned the value of patience from a young age," she says. "My parents definitely taught me that!" Nicole also says that many members of her family are in service-related jobs, and these influences have shaped who she is and the career path she's chosen. Her mom spent her life raising her and her siblings, her dad has been a firefighter for 30 years and two of her sisters grew up to become teachers. Her brother also works in hospitality as a bartender; the final sister is still in college. "As a firefighter, for many years my dad was out there potentially risking his life but also working so that his kids could have more opportunities," she says. After finishing high school, Nicole left New Jersey to study Hospitality Management at Boston University. She thought she'd be an event planner one day, but she ended up finding a job in Food and Beverage at a hotel back in New Jersey after graduation. She stayed in that job for five years, progressing to a few different roles, but then she and her husband decided to try something new and moved to the D.C. area. She landed at Hyatt Centric three years ago and now lives in Courthouse near Rosslyn. "I love the D.C. area," she says. "I grew up in a suburb, but after living in a city [for college] and then going back to a suburb after graduation, my husband and I knew we wanted to be in a city. My husband's from Lithuania, so we really like the international feel here. And I love working in Rosslyn! There are so many events here that there's always an opportunity to do something." Nicole also volunteers in the community, chipping in at A-SPAN and Arlington Food Assistance Center (AFAC), where she helps bag food for Arlington residents in need. At Hyatt Centric, she's organized the hotel's participation in the Arlington Chamber of Commerce's Volunteer Arlington Day. And when Hyatt Centric's beloved General Manager Ralf Hofmann passed away earlier this year, she collaborated with HIIT Nation to organize a bootcamp fundraiser for his family. But surely sometimes this giving and helpful person feels frustrated and stressed just like most people? Is she really always this nice? "Sometimes people have told me I'm too nice, but I say why not be?" she says. "There's a lot of awfulness in the world and there are so many people who only care about themselves. If I'm spending my time helping other people, I feel like it's time well spent." When she has encountered difficult people, Nicole says she tries to take it in stride. "Demanding people typically want something they know they can’t get," she says. "Sometimes it's good to just let them talk, because that’s what people like to do. If you just listen, eventually they talk themselves into their solution." Whether at work or at home, though, Nicole says her motivations are simple: She likes helping people and she enjoys making others happy. This desire drives her behavior as she goes about her day. She's also quick to point out that having an "awesome team" to work with doesn't hurt her attitude either. "I love my job and my team members," she says. "I work with my friends. We get our work done, but we don't dread it. It feels 100 percent like family."